SharePoint Analytics Vendors Comparison: Which Solution Is for You? Microsoft’s SharePoint is one of the leading tools to administrate your company’s intranet. It has a number of useful applications – from managing content, sharing files, data and resources, to using the solution to quickly find information and coordinate work across the whole organization. SharePoint is used to fuel productivity, improve the effectiveness of teamwork, and ensure collaboration within the company. It’s no wonder it has been the top information management solution for enterprises as well as small and medium-sized businesses. As we already pointed out in another blog post “5 Questions to Ask Before Choosing the Right SharePoint Analytics Solution” , SharePoint is the tool of choice for around 80% of companies on the Fortune 500, including businesses such as Nestle, UPS, Monsanto, Kraft Foods, and Viacom. Now that’s impressive! Deciding to choose SharePoint is the easy part. But analyzing the results from SharePoint to use it to its full potential and to optimize your intranet environment is a whole other story. More and more businesses recognize that another layer in their digital setup is not a luxury nor an unnecessary expense. On the contrary – it’s a necessity. If you buy and implement SharePoint without even attempting to start analyzing how users of your intranet behave, you’ll be halfway to nowhere. Using an analytics platform to improve your intranet environment helps you identify friction-points, streamline operations, and keep team members on the same page. An analytics solution for SharePoint has to handle massive volumes of data while offering clear insights and protection for your organization’s sensitive information. You need a tool that extends the capabilities of native SharePoint Analytics reporting to truly get a handle on your organization’s digital workplace. Yes, SharePoint comes with its own default analytical metrics, but there are far too many details you are not able to track and measure using them. Dividing your users into segments, analyzing the time spent on particular sites, tracking click paths of employees, tracking events, access to documents etc. You can’t analyze any of it with built-in SharePoint analytics. These are all things you probably associate with web analytics – and rightfully so. So you might think to yourself: a “regular” web analytics solution should be enough. Especially if you already have one and think it could be the fastest and cheapest way to analyze your intranet. And yes – you can do that, but there’s a reason why a number of vendors offer dedicated SharePoint analytics solutions. Why? Because your intranet environment doesn’t resemble your websites and therefore requires a specially tailored solution. You don’t want to track your intranet to optimize your marketing or sales process, you want to focus on the level of engagement of your users, on their activities: editing documents, adding files, and other activities unique to your business.To put it simply: not many web analytics solutions are built to deal specifically with the challenges of analyzing SharePoint systems. That’s why choosing an analytics tool for a use-case as complicated and wide-reaching as SharePoint can be a real challenge. There are various tools available on the market and a number of factors you should take into consideration when choosing the solution best fitted for your business. Webtrends has been on the web analytics scene for quite some time, having been founded all the way back in 1993. It has been associated mostly with web analytics, and has been known for being a highly customizable tool providing page-level clickstreams. In the last few years Webtrends has been acquiring several complementary tech startups (ClickShift, Reinvigorate, Widemile) and expanding its products. And just recently (at the end of year 2016) announced the release of its Webtrends Infinity Analytics solution. Webtrends says it can help users understand how to best manage communications protocols, assets, and archival processes. Webtrends SharePoint analytics allows its users to identify preferred content, access reports on end-user activity, search effectiveness, content access, and collaboration at the individual level. NGAGE was founded in 2013 and it prides itself on being an “all-Microsoft” solution built exclusively using Microsoft technologies for behavioral analytics in SharePoint as well as many other 3rd-party applications. Intlock, the company who created CardioLog Analytics has been a part of the digital analytics field since 2005. CardioLog Analytics focuses exclusively on SharePoint and Office 365 analytics with both on-premises and SaaS-based solutions. It lets you personalize your control panel with custom dashboards, provides real-time reporting, and claims to be the only On-Premise & SaaS SharePoint analytics solution for enterprises (but as you’ll see from our vendor comparison – that’s not the case). It can provide information about SharePoint usage and, as you can learn from company’s website: “improve the usability of your intranet”. Piwik PRO was established in Poland in 2013. With offices in the US and a strong presence in the European Union (Poland, Germany, and the Netherlands) it emphasizes its adherence to the strictest privacy standards on both sides of the Atlantic. It’s an enterprise-level solution and comes both in an On-Premises and Cloud-hosted versions. Piwik PRO SharePoint Analytics lets you gain deeper insights into all usage areas within your SharePoint service. It gives you the ability to detect irrelevant content so that you can keep decluttering your ever-evolving workspace and shorten the time your employees spend looking for information. Among the metrics and reports offered by Piwik PRO, you’ll get page tracking (with multiple metrics and reports available), unique visitors, library tracking, newsfeed tracking, click path, site search keywords and phrases, click through, downloads, error pages, goal tracking, and many others. Ultimately it all comes down to your organization’s requirements and plans. That’s why the first step in choosing the right SharePoint analytics tool is recognizing and listing your business’s priorities then comparing the SharePoint analytics vendors to learn how they differ from each other and which fits your business’ needs. 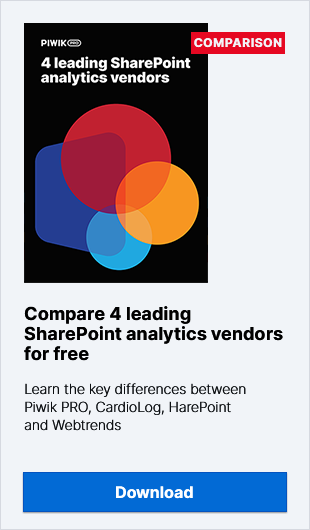 If you’d like to compare the specifications of the Sharepoint Analytics vendors discussed here, download our Free Comparison of 4 Leading SharePoint Analytics Vendors Guide. Learn how Webtrends, Piwik PRO, NGAGE and CardioLog Analytics differ from each other and find out which vendor fits your business’s needs.